IV Therapy- a solution for a most common complaint? And, it’s one uttered more by women than men. It has to do with our energy level. There are lots of us, it seems, that suffer from chronic tiredness. I’m not talking about the occasional problem staying awake during prime time sitcoms. I’m talking about fatigue that is persistent and limiting. You may even wake in the morning feeling as though you never slept. “How common is fatigue”, you ask? Experts say that 10% of people globally at any one time are suffering from persistent tiredness. And, it’s one of the most common complaints of patients visiting doctors. The National Institutes of Health informs that approximately one in every five Americans claims to have fatigue that is severe enough to interfere with daily normal life. Of course, there are many causes of chronic tiredness. Some of the most common are stress, allergic rhinitis, anemia, depression, and fibromyalgia. http://www.webmd.com/sleep-disorders/excessive-sleepiness-10/how-tired-is-too-tired Regardless, more and more people are researching the Internet, looking to natural remedies for tiredness. And, their research may lead them to visit to their local Whole Foods or Earth Fare store, where they buy vitamins or supplements they HOPE can boost their energy-deprived bodies. So, are oral vitamins and supplements the answer? There’s certainly nothing wrong with treating a tired body with vitamins and minerals. A deficiency in this area could, indeed, be contributing to the fatigue. However, treating this condition orally has limitations. Any physician will tell you that the human digestive tract has limited ability to absorb vitamins or supplements directly into the blood stream where the nutrients are really needed in order to benefit. 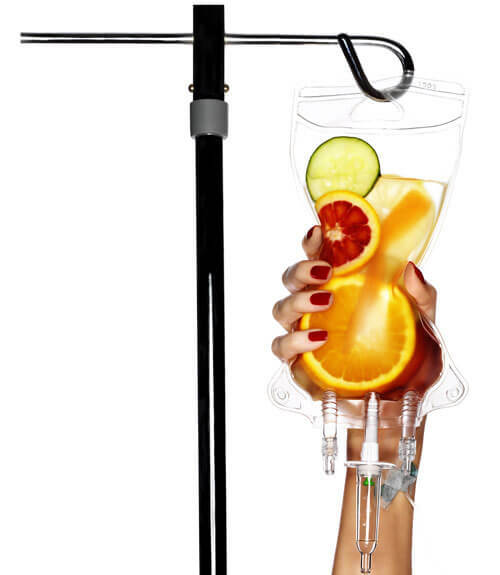 IV Vitamin/Mineral Therapy is the perfect solution. IV therapy is a method of infusing vitamins, minerals, and other natural substances directly into the bloodstream. Injecting these life-enhancing agents this way is beneficial in two ways. First, we are bypassing the limitations of the digestive system completely. Secondly, administering nutrients directly into the blood stream allows for higher than normal blood levels. IV Vitamin/Mineral Therapy can help in many health-related issues! Deficiencies, once diagnosed, can be corrected with a few IV vitamin infusions administered over one to three weeks in what might otherwise have taken two to three ears of oral supplementation to restore normal levels.